So, you have your vacation booked, you are packed, and now you are thinking about how you will entertain your child in the car or on the plane! Long trips are even longer when you have children who are fussy and bored! We traveled to the beach each year by car, and took the occasional flight when our children were young. I had quite a few tricks up my sleeve to keep everyone content (at least mostly content) on the way. Early on we learned that the trip to and from our destination had to become part of the “vacation”. In other words, we had to have that vacation mentality and enjoy that part of the trip too! You can have fun driving with a carload of kids I promise! Traveling by car allows you to see some great areas that you may not experience if in a hurry. During our yearly trip to the beach we found small towns, festivals, touristy attractions, and great parks for picnics. We soon learned that getting out of the car and enjoying the trip made it much more fun for everyone. Lunch is much better in a park where everyone can run and play than sitting quietly in a restaurant! Leaving early in the morning and stopping early in the late afternoon allowed the kids to play, swim, and become familiar with the hotel we were sleeping in that night. We learned the hard way that pulling into a hotel after a long day of driving at bedtime only resulted in crying children and frustrated parents. An early stop always resulted in kids settling in for the night easier and an earlier start the next morning. Entertaining kids on a flight or in the car sometimes takes some creativity. A mixture of new toys and old favorites usually works. Some toys were “special” vacation toys that were only used on long trips. We didn’t have the DVD players so common now, but our kids were very excited about the special travel toys we kept just for our long trips. You might think about using your DVD player for that purpose. Here are a few ideas that may work for you. I found packing the toys in a bag and getting them out one at a time as needed worked well. Sometimes even wrapping the new ones made it so much fun to unwrap and see the new surprise toy! A trip to the dollar store or the Target Dollar Aisle is a great place to pick up some of those new items. Travel sized Magna Doodle or Aqua Doodle. Reusable stickers or “clings” that can be put on car or plane windows. Treat bags became a vacation tradition with our kids. We always packed a few snacks, some healthy and some special treats. To this day, I pack a “treat bag” even for my husband and me when we head out on a road trip! Slow down, stop, let your child out to run and then provide a quiet activity once back in the car seat or on the plane. Take a deep breath and enjoy having your family contained in one spot…something that, believe it or not, you will look forward to when your children are a bit older and busier. Talk, sing, snack, and maybe even nap on the way (not the driver of course!!) :)…Family vacations are simply time together, time together doing something different….so be sure that your vacation begins when you leave your house. The trip to and from your vacation CAN be fun too! What do you bring to make your travels more fun? Share your ideas!!! Lovely and helpful tips here. 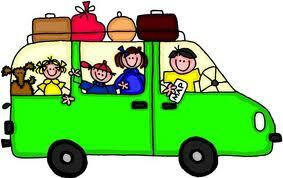 Sometimes, the thought of going on a trip scares a lot of moms just because of keeping the kids occupied on long trips.